Name badges are the perfect way to say, "Hello!" 1959, C-Line introduced the "Hello, my name is" badge, and ever since then the market leader in name badge holders was born, we're ready to meet your every need with clip, colored stripe, clip/pin combo, pin, magnetic, hanging, security and pressure sensitive name badges and holders. This fabulous VISITOR badge is perfect for small meetings, seminars and conferences. It features a unique tabbed edge with an easy to peel off backing paper allows for easy application. "Visitor!" name badge is the perfect product to break the ice. Insert Size: 3 1/2 x 2 1/4"
Transcript: Welcome to MyBinding.com. These are the Blue Visitor Peel & Stick Name Badges from C-Line. These self adhesive badges have a bold blue color with a large white area to print or write the wearers name. Beneath the name area there are fields for the issue date and expiration date to prevent misuse of the badges. The edge of the badge provides an easy tab to remove the release liner, and the self adhesive is strong enough to stay stuck to fabric without leaving residue. Welcome to MyBinding.com. 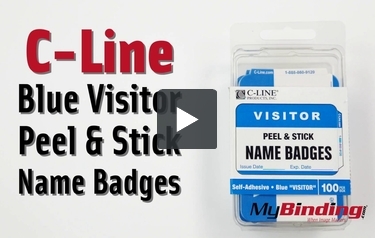 These are the Blue Visitor Peel & Stick Name Badges from C-Line.